Beautiful natural colored fawnlight fur blanket made from the most exceptional SAGA Furs fox pelts. The fawnlight fur blanket is exquisitely soft, offering unparalleled quality and luxury. The fawnlight foxes are from Scandinavia, bought from the prestigious SAGA Fur Auction in Helsinki. This beautiful natural colored fawnlight fur blanket is pure luxury, the full hair, the cozy warmth and the incomparable softness of the natural colored fawnlight furs fascinates everyone. The back lining is made of high quality and soft wool, which forms a perfect duo with the real fur. Lars Paustian guarantees you the highest quality of fox skins and quality processing in Germany. If you have questions or individual requests, please do not hesitate to contact us. Related links to "Natural Colored Fawnlight fur blanket (SAGA Fur)"
Customer reviews for "Natural Colored Fawnlight fur blanket (SAGA Fur)"
It has arrived, and WOW! Just incredible! I've never seen another blanket with such high quality fur. The last blanket I bought from you my wife confiscated it immediately for herself, so this one's mine. Thank you, for everything! 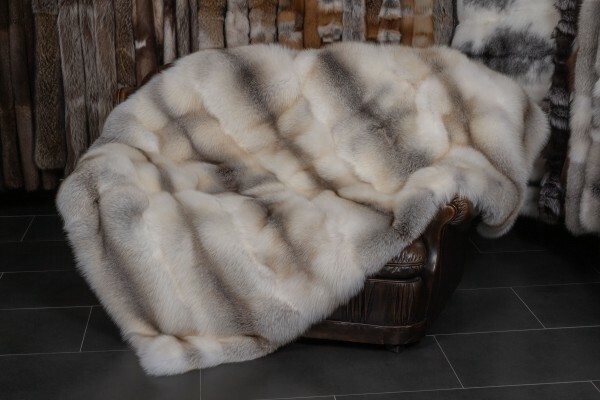 Rabbit Fur Throw "Chinchilla Style"